Tucked between Chicago’s Pilsen and the Illinois Medical District, Ruido Fest welcomed a variety of genres from the Latin alternative genre. 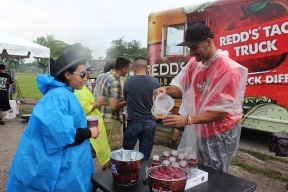 A truly first-of-its-kind music festival in the Windy City, attendees were able to catch acts on three different stages and enjoy flavorful food that characterizes Latin cooking. Considering that Latinos make up 26 percent of Chicago’s population there hadn’t really been a music festival with Spanish music at its core. 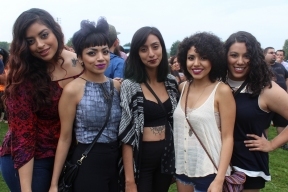 Even with its name Ruido (meaning noise/sound) already welcomes a different atmosphere, “Ruido Fest is unlike any other music fest I’ve ever attended,” said Vania Cebrero, 23, Logan Square native. “It brings the Latino community together by combining different aaspects of Latino culture [music, art food]. Chicago needed something like this for a long time.” In addition to the staple foods, music and art that represent Latino culture, an area of onlookers witnessed luchadores duke it out in a lucha libre. Wrestling, or lucha libre, is a popular form of entertainment throughout Mexico, and although very staged crowds love the antics. 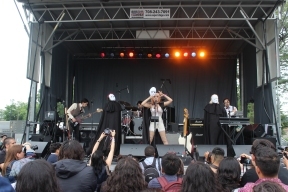 Music transcends borders and languages, and despite Ruido Fest’s Latino centric music scene non-Latinos embraced the ruido and relished in the sonidos y sabores of Latino culture. See you at next year’s Ruido Fest!